Exploration of complex and dangerous territories posts great challenges for robotics research. Intuition suggests that using cooperative multiple vehicles will increase time efficiency. Coordination of multiple vehicles typically relies on communication between vehicles, but direct communication is easily blocked or at least attenuated by obstacles. Hence one major challenge for a successful multi-vehicle strategy is the lack of line of communication (LOC). Recently, small, low-cost devices equipped with short range communication and low power sensors, such as the Berkeley MOTES, become commercially available. A large number of such devices may form a sensor network and establish the LOC between each other. In an ideal situation, each device serves as an information node and together they form an information network that relays information between devices. We develop a strategy that enables multiple intelligent vehicles to cooperatively explore complex and dangerous territories. Vehicles lay out an information network while constructing a topological map based on the Voronoi diagram. The information network is represented by a communication graph and a coverage graph. Vehicles communicate via the information network while expanding both the topological map and the information network. Our exploration algorithms are provably complete under mild technical assumptions. Theoretical performance analysis of the algorithms shows that in a bounded workspace, the time spent to complete the exploration decreases in proportion to the number of vehicles employed. The algorithms are demonstrated through simulation results. J. Kim, F. Zhang, and M. Egerstedt. Simultaneous Cooperative Exploration and Networking based on Voronoi diagrams, submitted to IFAC Workshop on Networked Robotics, 2009 (Submitted). J. Kim, F. Zhang, and M. Egerstedt. 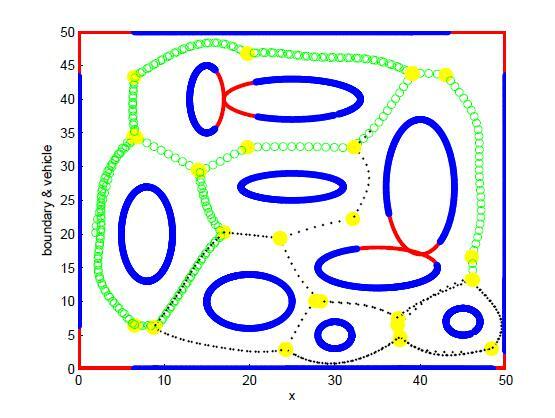 An exploration strategy based on construction of Voronoi diagrams, submitted to IEEE Conference on decision and control, 2009 (Submitted).